The Automated Negotiation Agents Competition (ANAC2014) was organized. Previous works proposed agents that had various strategies. 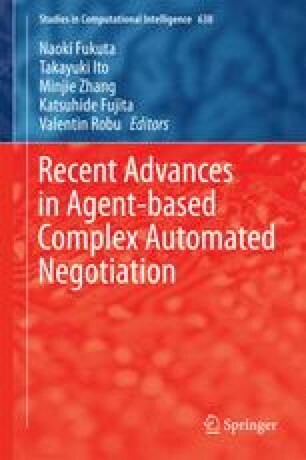 In this paper, we developed a negotiation agent (WhaleAgent) for ANAC2014. WhaleAgent has two searching bid strategies and two bidding strategies. The searching bid strategies use Simulated Annealing and Hill Climbing. The bidding strategies are Hardheaded strategy and Conceder strategy. We describe these strategies based on the heuristics.